Art-in-Buildings: Much of your work takes familiar or recognizable objects and alters them to create a surrealist and sometimes sinister intervention. What comes first – the object or the idea? 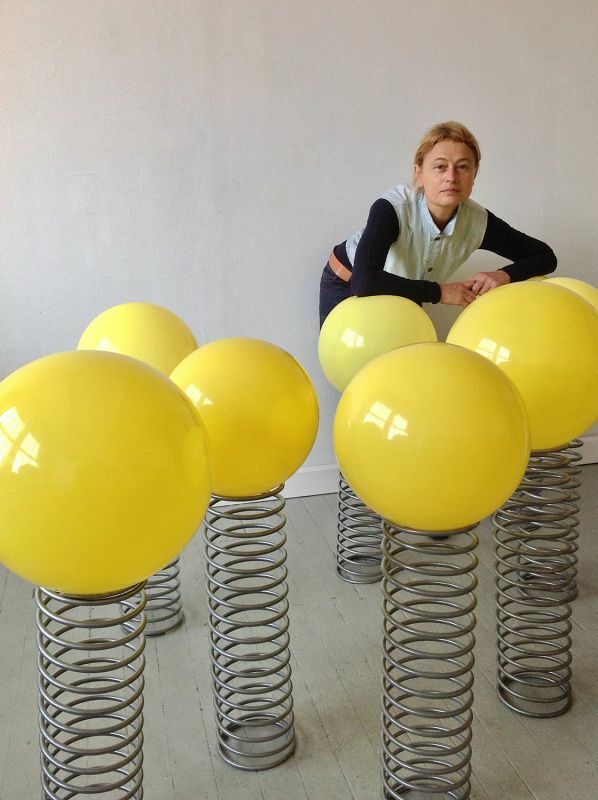 Inna Babaeva: The commercially available material - objects of interior design or furniture - usually serve as a departure point for my sculptures. The choice of the objects is based on my interest in their formal aesthetics and their functional purpose. I am simultaneously interested in both. I alter them to eliminate their original function, to change their minimalistic appearance by adding grotesque forms and bright garish colors. Familiar and mundane is undermined by absurd and deviant. AiB: Arrows appear throughout your work. What draws you to this symbol? IB: The arrow is a ubiquitous symbol, but it can carry very different meanings. It can have an almost indefinite purpose: they can signify a tool of protection or hunting in indigenous cultures, an attack direction on a war map, or just a street sign pointing out in the right direction. 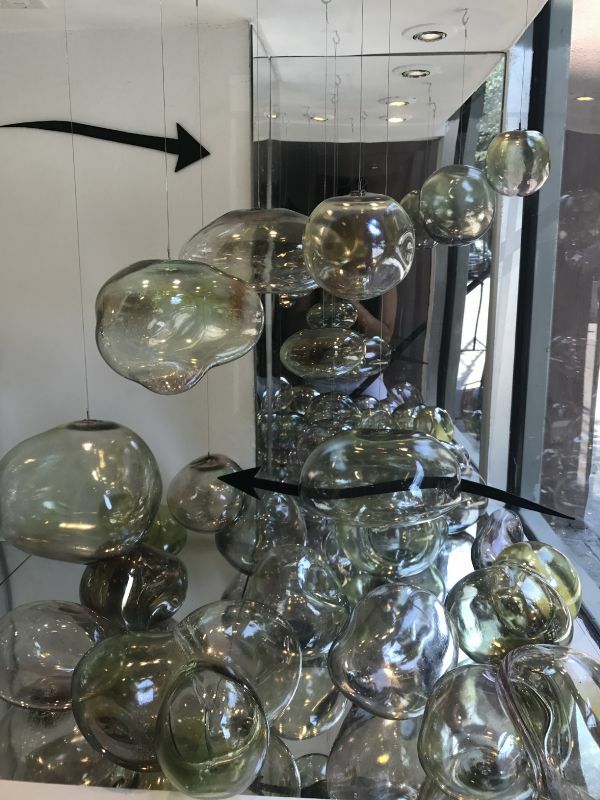 The two arrows that I used in Men O'War installation represent different symbols: one is attacking and breaking through a glass bubble, and another, pointing out on how to exit to the street. But you cannot believe in any of these arrows' intentions - to destroy and to direct - due to their cartoony appearance. 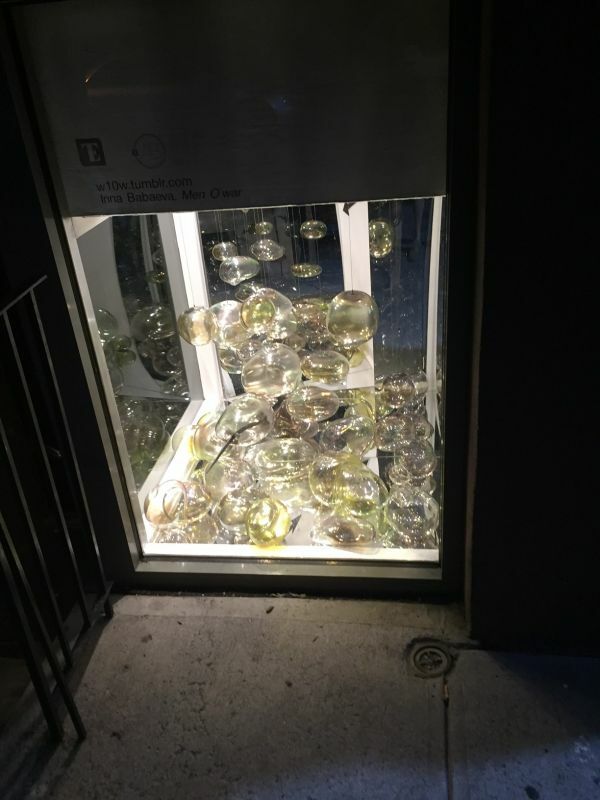 AiB: Your practice invites audience interaction – whether through a guerilla-style IKEA install of altered objects, or in the case of the West 10th Window, with reflected surfaces. How are you hoping to engage the viewer in your installations? IB: I like the viewers to engage with my work not only in a physical way, but also by questioning the context and value of art that they are encountering. 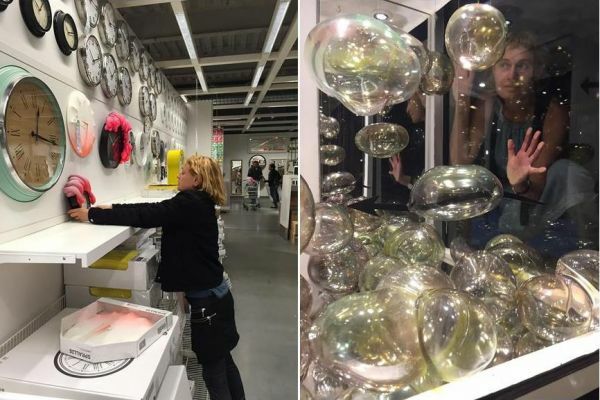 In the IKEA invasion project, I wanted to invite the viewer to contemplate about the value of artwork displaced from the context of an art gallery into the context of an IKEA display. I augmented various IKEA products - clocks, chairs, coat hangers, shelves, and picture frames - in my studio, and brought them back to IKEA Guerrilla-style and placed them back on displays shelves and wall from which they originally came. This was my way to reflect on matters of commodity values, and how those change due to some contextual displacement: does the visual embellishment of consumer goods make them more precious by injecting the value system of art, or does it make them less attractive because of their practical uselessness? In the project on West 10th Street, I wanted to engage pedestrians into noticing the space by employing not only mirrored walls and floor, but also by utilizing translucent and iridescent glass forms that multiply infinitely by the multiplication of reflections. I wanted a viewer to be surprised to discover some precious objects in a place where it is least expected – in a window of a basement. AiB: How did working with the confines of the West 10th Window influence your work? 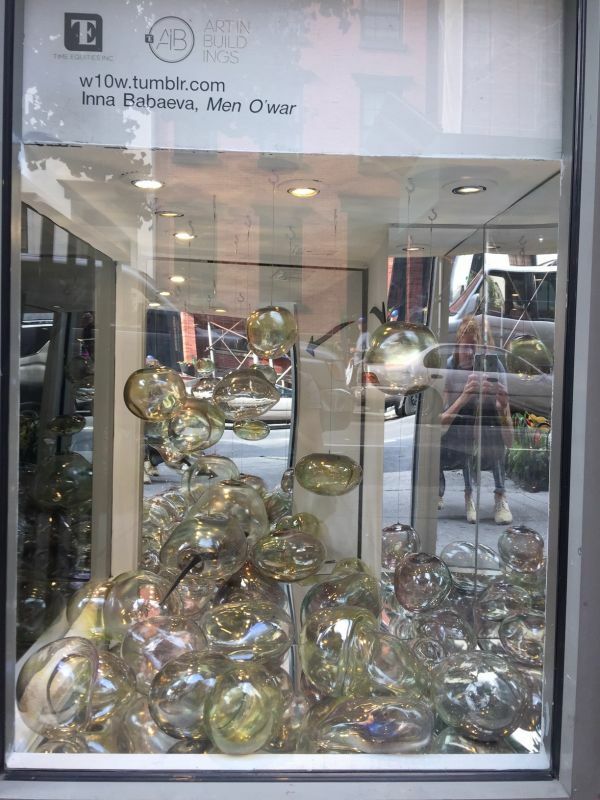 IB: The work for West 10th Street Window was created in response to that site's spatial and contextual limitations, since the windowed bay is very small and its ceiling is only three feet above street pavement level. Pedestrians can hardly notice it, so my goal was to "open" the space and invite in the street light, the local landscape, and curious passersby. To do this, I covered most of the wall space and the floor with mirrored Plexiglas, and created transparent glass objects with a hint of iridescence. The result made the space feel much larger and easier to invite the street into that tiny 3 x 3 x 3 foot space. 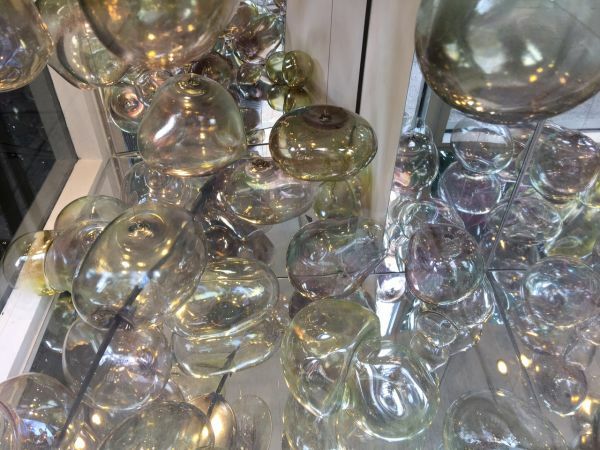 Working with the medium of hot blown glass for this project gave me further insights into this material's possibilities and the lessons learned from this experience has given me fuel for my next project in glass. IB: I have some work in a group show at Kienzle Art Foundation in Berlin that has opened this month. I was fortunate to receive the Urban Glass visiting artist fellowship this year and very happy to continue using its amazing facilities and, with the staff's generous help, to create a new series of work that conflates hot blown glass forms with household items, furniture, and interior design objects. Learn more about Inna Babaeva on her website!